My dad still remembers seeing Joni Mitchell. (It helps that he still listens mostly to the albums that soundtracked his college years, which I suppose dooms me to trying to explain Sufjan Stevens to my kids while they listen to post-post-chillstep on their Apple iEars.) I’ve never listened to Miles of Aisles so I have to imagine what it must’ve been like, to see the best folk songwriter of her day at the height of her powers. 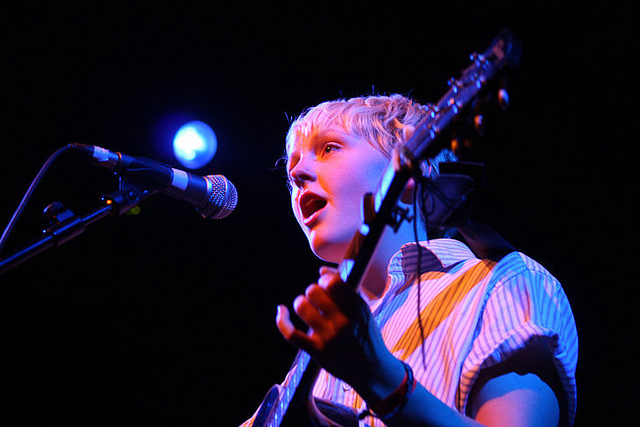 It was probably not unlike last night’s Laura Marling show, which was both as triumphant and intimate as any concert’s likely to get this year. Openers Alessi’s Ark, fellow U.K. folkies and members of the same revivalist scene that’s also spawned inferior (and coincidentally, male) acts such as Noah and the Whale and Mumford and Zzzz, played to a previously unfamiliar audience and won them over completely. (The girl who mouthed every lyric to “Wire” should consider herself the coolest person in the room.) Alessi Laurent-Marke’s voice is deeply breathy and almost free of vibrato, rendering her notes fine and pure enough to be white sand from some undiscovered beach. (Or, uh, drugs, if you want to go there.) Her songs, mostly from the very good new album Time Travel, were charming enough, though they tended to slip into repetitious one-chord-per-bar strumming — a limitation she recognized when she stopped one song to note, “It just goes on and on like that for a while.” Good as she was, her banter was even better, cracking jokes about her father’s fondness for California fish tacos and the state of the Troubadour (“It’s very wooden”). Alessi Laurent-Marke was born in 1990, which made her self-assurance — and talent — very nearly jealousy-inspiring. That emotion was more than evoked by the performance of the also-21 Marling, who was joined by a five-piece band and led them like Barack Obama on Election Night 2008, though the whole show was kind of embarrassing for America, given that Taylor Swift will spend the next 60 years of her life never writing a song as good as “Goodbye England.” Despite the centuries of U.K. folk tradition that manifest in Marling’s work (particularly the minor-key, finger-picked waltzes that she correctly dubbed the “bum-out” section of the set), the early ’70s could very much be her home. As a stream-of-consciousness writer who avoids editing, she’s like Neil Young; her more recent, intentional forays into twang borrow from Gram Parsons and the Byrds; her more dramatic, dangerously electric arrangements nod to Led Zeppelin; her free-ranging melodies, which come in small, somber lows and a wonderfully high vibrato that unfurls like a proud ship’s sails, are extremely Joni. A Creature I Don’t Know, her third album, is probably her Ladies of the Canyon, a good, often great release that’s sure to be toppled by a long, rich career. The new songs are best when they ease into a chord-driven trot and Marling soars over them, as on “I Was Just a Card” and “Sophia,” a song that turns sort of hilariously into a riff on Ryan Adams’ “New York, New York” before breaking into the stoner vocal harmonies of Aerosmith’s “Sweet Emotion.” She abandoned the harmony bit last night and the song was none the worse for wear, though I imagine that won’t score her a gig on the next season of Idol. Early on, she claimed to dislike banter, but that didn’t stop her from being nearly as chatty and amusing as her opener. She interrupted one song to giggle at her own gravelly low notes, poking fun at having chosen the wrong key to write in. I don’t have much room in my ears for artists who take themselves too, or at all, seriously; Marling, despite her wealth of talents, is not one of those artists. At her age — she could be a college senior writing blog posts about relationships for Thought Catalog right now! Examine your life choices, youth of America — she’ll need to hang on to that as her popularity grows beyond sold-out Troubadour sets, but I think she’ll be just fine. Can’t wait until she writes her Blue. More notes: A particularly cranky security guard almost interrupted Marling’s set five or six times to tell people to stay out of the balcony walkway. It probably would’ve been a good show to sell 30 or so fewer tickets to, but I’m not the fire department. The crowd was at least 80% female and 20% sensitive-looking dudes, whose Being Discerning About Music And Also Feelings credentials were only enhanced by having skipped the Bon Iver show across town. Men who weren’t there missed out for all of the above musical reasons and also because Marling is excruciatingly prettier than Justin Vernon. Editor’s note: I didn’t take any photos because the venue didn’t have my photo pass. I emailed them about it and will save you my irritation.